Hotel Meridian is a newly built hotel that has been edified to proffer the standardized amenities to all the guests. 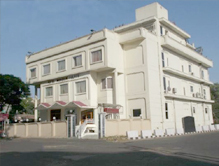 The hotel is situated in the commercial epicenter of Jammu. It is at a close proximity to the airport, bus stand and railway station. Major attractions of the region, such as Raghunath Ji temple, are also within easy reach from the hotel. The hotel lies just a few kilometers away from Ban Ganga and Yatra Ticket Counter as well. The warm hospitality and highly caring amenities of the hotel make it one of the best luxury hotels in Jammu. Accommodation There are 24 well appointed and spacious rooms in the hotel. There are suites, family suites and rooms in the hotel, proving a spellbinding view. Each room in the hotel is elegantly designed and equipped with top notch amenities such as mini bar, satellite TV channels, internet facility and lift facilities in all the rooms. The water supply is round the clock providing both hot and cold water. The room service available all round the day to the guests. Dining The hotel comprises an in-house restaurant. This restaurant serves the palatable cuisines to elate the taste buds of the guests. The assortment of scrumptious delicacies incorporates Indian and Chinese cuisines. The guests can enjoy the meals in their rooms as well. The dining services in the hotel provide a never to be forgotten experience. We at Tour My India, offer you the unmatched deals on the hotels in Jammu. We offer the perfect arrangements for your comfortable stay in Hotel Meridian, Jammu. Avail the deals from us and be assured of a relaxing stay that you are actually looking for!